At the UK Fairy Company, we love to fuel your imagination through the creation of bespoke and real fairy villages. 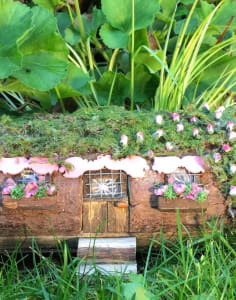 This is a fun and creative workshop where you can relax, meet like-minded people and gain the skills and inspiration to build enchanting fairy homes. You will have your own beautiful and unique fairy home to keep. They are beautiful on a window cill, balcony or garden. Some have attended multiple workshops and have created a fairy village at their home - or once you have done one workshop you will have all the skills to do this in your own time! Extensive materials are included in the workshop price - logs become beautiful and natural homes. This workshop is suitable for all ages and is suitable for adults and children alike. This is a beautiful workshop to do with your child or grandchild (age 4 plus) - please contact us and we can make sure you are booked onto a suitable workshop for children. Anne Scott is a huge fairy enthusiast and artist. For 2 years Anne has been making and selling this amazing fairy homes. Anne was asked to do a workshop and realised people love making this fairy homes as much as she loves hosting workshops - and hasn't looked back since! We would love to hear from you! If you have any questions, please contact me using the ‘contact host’ button on the website page.